As I have noted in blog posts and my May, 2017, VEER column, the husband and I strongly backed Ralph Northam for the Democrat gubernatorial nomination. Despite his endorsement by Bernie Sanders and Elizabeth Warren - who, in my view, should have kept their seemingly uninformed noses out of Virginia's business - and his recent campaign ads, Perriello's history largely did not match up with his newly claimed positions. Among other things, he opposed a ban on assault weapons, he voted to cut funding for women's reproductive care and supported offshore drilling off Virginia's coast, something that would have threatened both Virginia's tourism trade and its seafood industry. Not exactly progressive stances. Northam's approach on these issues have been the opposite of faux progressive, Perriello. Similarly, Northam embraced the LGBT community, while Perriello has been largely invisible other than attending the Equality Virginia Commonwealth Dinner in April. Again, not a progressive approach. With Ralph Northam's win against Perriello yesterday, Virginia Democrats now have a candidate with a progressive track record who has the demeanor and resume to attract moderates and even liberal Republicans (to the extent any exist) in the general election in November. For Perriello supporters, progressive ideology is fine and good (I agree with most of it), but if your candidate cannot win in the general election, then you have yielded the field to the Republicans who will push an agenda diametrically opposed to progressive values. I truly wish that Bernie Sanders and Elizabeth Warren had minded their own business and not help caused a waste of resources better directed against Republicans. Most remarkable of the vote yesterday was right wing extremist Corey Stewart's near win over Ed Gillespie (the results are within or close to the recount margin). Frank Wagner, perhaps the most sane of the three GOP candidates came in a distant third. Stewart's campaign focused on everything that Donald Trump has championed and which decent, moral people find abhorrent: religious extremism, unlimited gun rights, propping up the moribund coal industry, and personhood status for fetuses, thus banning most forms of contraception. And then there is Stewart's support for the Confederate flag and monuments to Confederate generals and officals on public property. LGBT rights are not specifically mentioned by Stewart, but given his self-prostitution to Christofascists on other issues, Stewart would be a nightmare for LGBT Virginians. Assuming Gillespie wins, it will be a disappointment for those who would have loved to see Ralph Northam run against an extremist like Stewart. That said, Gillespie may be pressured to embrace some of Stewart's more extreme positions to encourage the GOP base to turn out in November. If that happens, it can only help Ralph Northam. Ralph Northam, the candidate endorsed by powerful Virginia Democrats, prevailed on Tuesday in the state’s Democratic primary election. Decision Desk HQ called the race just prior to 8 p.m. ET and The Associated Press called it soon after. The Republican primary remains undecided and locked in a tight race between Ed Gillespie, who had been considered a heavy favorite to win, and controversial conservative challenger Corey Stewart. Political observers had not expected that the GOP race would become so closely contested as votes rolled in. Gillespie, a former Republican National Committee chairman, has led nearly all public polling in the race, while Stewart has trailed behind. Turnout among Democrats suggested an uptick in enthusiasm. 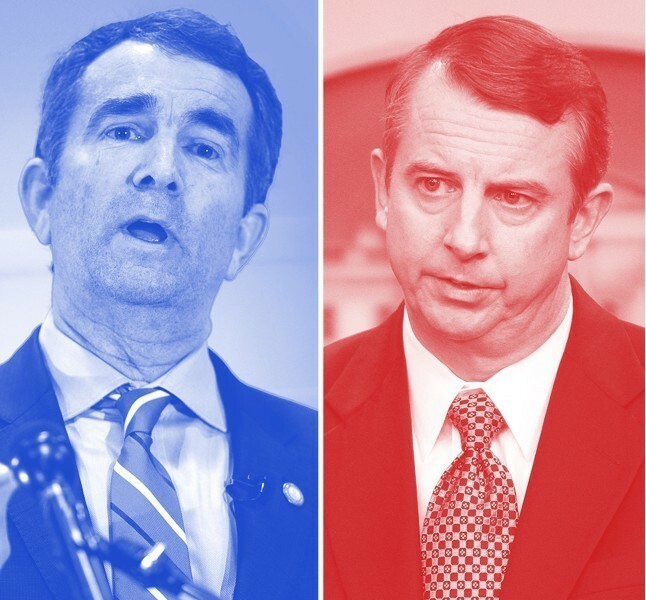 According to Politico’s Gabriel Debenedetti, Northam has an estimated [303,429,435] votes, while Gillespie and Stewart combined have an estimated [315,755] votes, so far. Virginia’s competitive Democratic contest has been closely watched as an early test of what liberal voters in a battleground state are looking for in a statewide candidate following the party’s White House defeat. The outcome of the race is likely to disappoint supporters of progressive icon Bernie Sanders, who endorsed Northam’s opponent former Representative Tom Perriello. It may also be interpreted as a sign that traditional predictors of success in primary elections have retained their resonance even in the topsy-turvy political climate of the Trump era. Northam locked down endorsements from long-time Democratic power-brokers in Virginia, including McAuliffe, and Senators Tim Kaine and Mark Warner, as well as a coveted endorsement from The Washington Post. McAuliffe released a statement Monday congratulating Northam: “This election will be a choice between electing Ralph Northam and building on the Democratic successes we've achieved together or electing Republicans who will support Donald Trump's agenda of cutting taxes for the rich at the expense of Virginian's education and health care,” he said. Stewart’s strength on the Republican ballot was perhaps the biggest surprise of the evening. He had been running as more Trump than Trump, making provocative statements and campaigning on the issue of preserving Confederate monuments. Polls had shown him with a fraction of Gillespie’s support, but a low turnout among Republican voters gave Stewart’s committed base an outsize influence, and Wagner drew significant votes in Hampton Roads that might otherwise have gone to Gillespie. Gillespie’s strength in Fairfax County seemed to be providing the edge as final returns came trickling in. Stewart scored big wins in Washingto’s exurbs - Loudoun, Fauquier and his own Prince William County - as well as in the rural central and southwest regions of the state. Stewart’s unexpectedly strong showing shocked Republicans at Gillespie’s party at a Hilton Hotel ballroom in the Richmond suburbs, where supporters who had expected a blow-out were concerned to see Stewart running a close second. “I’m shocked,” said Nancy Russell, who was Hanover County chairwoman when Gillespie ran for Senate in 2014. She was worried that Stewart would doom the GOP’s chances in November if he won the nomination. “If Donald Trump didn’t carry the state of Virginia, I don’t know how Corey is going to,” she said. Trump’s approval rating in Virginia is even worse than it is nationwide: Only 36 percent of Virginians were satisfied with his performance in a poll conducted last month by The Washington Post and the Schar School. A Stewart victory in the primary would, in effect, put Trump on the ballot - making November’s election a clear referendum on the president and his policies and style. Stewart's near win underscores the reality that the Republican Party is the party of religious zealots and white supremacists. The GOP that I knew is truly dead.